Installing carpet on the garage floor is an idea that is not new. In fact, people have been doing it for years and are attracted to the thought of a garage flooring option that creates a warm atmosphere and insulates from the cold of winter. But before you jump at the idea of laying your favorite threads in the garage, take a moment to learn about the pros and cons of garage floor carpeting, safety concerns, and how to choose which carpet is best for a garage environment. I’m sure most of us remember that one house on the block that had the shag carpeted garage floor. It was a novel idea that looked nice for a while but soon fell victim to wear and abuse and started to look shabby after a year or so. Well, people are still carpeting their garage, but many are not aware of the problems that the wrong carpet can create. Standard carpeting is not designed for the garage, nor is it safe. While it might seem like an inexpensive garage flooring idea to use standard carpet remnants from the home, it poses many problems. It can create mold and mildew issues, it is tough to clean properly, and it breaks down from automotive fluids. Most of all, it is a fire hazard. There are more cases than you think of homes burning down because of a fire started in the garage due to petroleum soaked carpeting. All it takes is an ignition source such as a spark or flame. In fact, many local ordinances do not allow for the installation of indoor carpeting in the garage. So what are you to do? The answer is to use carpeting that is made for outdoor or automotive use. Commonly known as indoor outdoor carpet, it is made of polypropylene fibers or a material known as Olefin synthetic fibers. This material is resistant to staining, abrasion, U.V. fading, as well as mold and mildew. Most importantly, it is much more fire resistant and has a tendency to melt when exposed to flame or intense heat instead of catch fire. Fabric garage floor mats are made of such material. 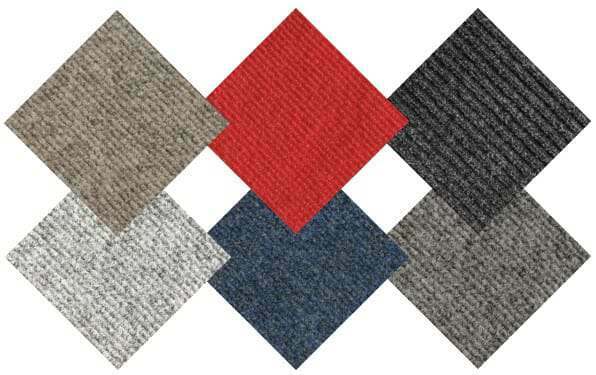 Most indoor outdoor carpet comes in 6’ and 12’ widths and is available in a variety of colors and textures. Pricing can be just under $1.00 per ft² for the bargain-basement carpet, while the higher quality options start around $1.5 per ft². When choosing the right carpet for your garage, it’s ideal to find one with a rubber marine backing. This backing makes the carpet more resistant to moisture from concrete and wet environments. This is important if you live in an area that receives an abundance of rain or snow that can be carried in with your car. Where can I buy carpet for my garage floor? We have found that Amazon is a great resource to purchase indoor outdoor carpet for your garage or basement. They have a large selection of colors and they even ship it for free. Proper installation of the carpet requires that you glue it down to the concrete. You cannot just tape down the edges like some manufacturers suggest. The forces created from parking your vehicle or turning the wheels on the carpet will cause it to buckle and pull up the edges if you do not glue it down. Fortunately, it’s not too difficult to do and can be accomplished as a DIY project in a weekend or less. A vacuum is all that is required for standard cleaning maintenance. Tougher spills and stains such as oil needs to be cleaned with a warm household dish detergent and a soft brush. Do not use harsh chemicals because it can cause the backing of the carpet to deteriorate. Because of their synthetic makeup, oils generally will not stain the carpet, but it can require more than one attempt to remove all the oil because of the wicking properties of the material. A previously cleaned oil stain can appear dirty again after it has dried because any remaining oil that was at the base of the carpet is wicked back up to the surface. While the idea of carpeting a garage floor has its merits, we do want to point out that it may not be the best garage flooring option depending on how you use your garage. If it is mainly used to just park your cars, access storage, do laundry, or work on small projects at your work bench from time to time, then installing carpet may be a good choice for you. Plus it feels better on the feet than cold concrete. If you like to tackle larger projects in the garage such as wood working, car repairs and maintenance, metal shop projects and etc., you most likely should look for a different flooring choice. Wood chips and metal shaving are much more difficult to remove from carpet as well. Also, repeated exposure to automotive chemicals can slowly cause deterioration of the backing of the carpet. Admittedly, installing a garage floor carpet does have some nice benefits and can be a good choice when used in the right environment. If your garage sees light duty use without big projects and car repairs, then it just might be the right choice for you. However, if you’re the type of person who seems to spend more time out in the garage with projects, cars, toys, and more, then you might want to consider a more appropriate garage flooring option that will stand up to the abuse and hazards of a high traffic garage. I have laid regular commercial carpet in garage floor. I use this area in summer only for a den area. Winter it goes back to being my garage. Last year I brought a tarp and covered the carpet which was very rough to keep snow and rain off of carpet. I had to keep pulling on it etc It worked but does anyone have a better suggestion of keeping this tarp in place. Hi Gloria, you may want to try a containment mat instead of trying to cover the entire carpet. You can read about them here. I’ve had my garage carpeted with indoor carpet for 4 years. I use my garage as a painting studio with furniture. It worked great until the hot water heater busted and the carpet got soaking wet. It smelled terrible and was awlful trying to get it out of the garage damp. Black mold started to grow on the cement floor after carpet removal. Not fun to deal with. Moving all the furniture and wet carpet out was terrible. I have since had the garage treated for mold on the cement floor and this time placed an indoor/outdoor carpet in garage which would be easy to move if water damage occurred again. My garage is 24 x 24 and is one of my favorite rooms to sit back in watch a Lil TV, paint and invite guest in. Don’t have to worry about floors getting dirty. Thanks for reporting on your experience Dana. 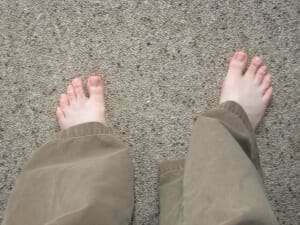 As you found out, there are pitfalls with using regular carpet. You shouldn’t have anymore issues like that with the carpet you have now, even if your heater busted again. We have several rolls of new carpet that needs to be stored in garage floor that gets quite damp in winter. We have rolled the carpet in plastic wrap and taped ends together with carpet tape and have laid the carpet on 1″ boards, will the carpet be safe, we are painting house and will then put carpet in house, but am concerned if this will protect it enough? It should be fine as long as the carpet is kept off the floor without moisture getting to it. I’ve had commercial carpet tiles in my garage for years. They will outlast the building. I have four cars in there and work on cars in the garage too. For the one car that leaks a little I have a rubber mat on top of the carpet where the engine is. for a messy project I just put a few sheets of Masonite duck taped together under the project car. In the back area where the bench, vise and drill press is, that area is vinyl tiled. Open the garage door and use a leaf blower to rid the small stuff, vacuum as well. Can’t beat it. Not good for wood working though, otherwise great. Those are great tips Charles. We know that when the proper carpet is used it has some good advantages. I can have access to astroturf that was used on my golf coarse practice range. They are 7 ‘ x 6’ strips. It is thick and looks great. I was planning on using it in my 2 car garage. Do you see and downsides to using it? I can always take pieces up to wash if necessary. It will not go around the 2 ft border around the perimeter of the inside where I have cabinets and shelving. Hello Tony. The issue will be how you adhere it to the concrete. If you glue it down you will not be able to pull it up very easily to wash. Double sided tape would be better, but with the smaller strips you are working with you will need to be sure that you don’t turn the tires much on the turf or it will bunch and pull up from the tape. Difficult yo remove glued down I/O. Could a concrete surface be applied without removing carpet? Hi Tami. No, unless you are pouring a regular 4″ slab, the carpet needs to be removed first. Trying to turn my garage into a bedroom? I have 3 bedroom upstairs, but I’m afraid I won’t be able to make it up at some point. I’m 57 and have health issue’s already. Trying to do this job as nice and cheap as possible. I haven’t done any DIY. So need all the help I can get? 2 car garage. Structural I would like a window? I have water already for poss. shower. I can’t figure out how to do the floor? Hi Cindy. Turning the garage into a bedroom is much different than just putting carpet in the garage. In most states permits as well as an inspection is required in addition to certain safety measures that have to met. We recommend visiting your local building permit and planning office to get more information. I have a plywood floor in my garage, an old stable with a basement. Should I use olefin or green indoor outdoor or what? No living space below. How about a linoleum or vinyl sheet? Hi Jim. We definitely recommend that you use carpet approved for automobiles. Such carpet has special polypropylene (Olefin fibers). Another option for a plywood floor would be vinyl roll out mats. Call you local carpet store. Their prices will be as good if not better than most amazon sellers, Lowe’s or Home Depot. And, you will get advice specific to your application and you might even find they will install it for you inexpensively with the right glue. Hello Joe and thanks for your input. We actually thought the same thing before we wrote this article. Our minds changed, however, when we checked with some of the big brand carpet companies in our area. To our surprise, they either didn’t sell outdoor carpet or their prices were out of line. However, that doesn’t mean that someone might find a local carpet store in their area that can accommodate their needs at a good price point for the appropriate carpet for garage use. It’s never a bad idea to check locally for something like that. I will be turning my garage into a lounge area where I would watch tv, smoke cigars, and have some food and drinks with small number( <6) of friends, especially during football season. I do intend use the garage for parking cars or doing any type of projects. Your recommendation on type of carpeting. Hi Michael. Are you saying that you do or don’t plan on parking cars and doing projects in the garage? You state you do, but I get the feeling you meant that you don’t? If not, you can put any type of carpet in the garage that you like. I will not be parking cars in the garage. OK, Mike. If the surface is sound, then you can apply any type of carpeting you like. It would be applied in the same manner as it would in the interior of the house.